The residential and commercial building Aspen Residence with a total of 26 storeys is being built in Penang. While the construction team worked on the first thirteen storeys with timber and boards, the DUO lightweight formwork was used for the shear walls of the upper storeys. With horizontally and vertically arranged DUO panel extensions, up to 3.25 m high units are mounted which are used 4 to 5 times per storey. 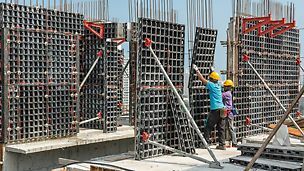 Due to the low weight, no crane is required to assemble and move the formwork. As a result, no time is lost waiting for the crane which accelerates construction work. 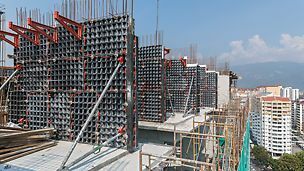 The simple formwork logic very quickly ensures fast working with the innovative system. 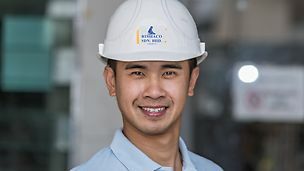 Furthermore, the reduced cleaning effort results in time savings as the concrete does not stick to the formlining, it can be easily and quickly cleaned after every use. 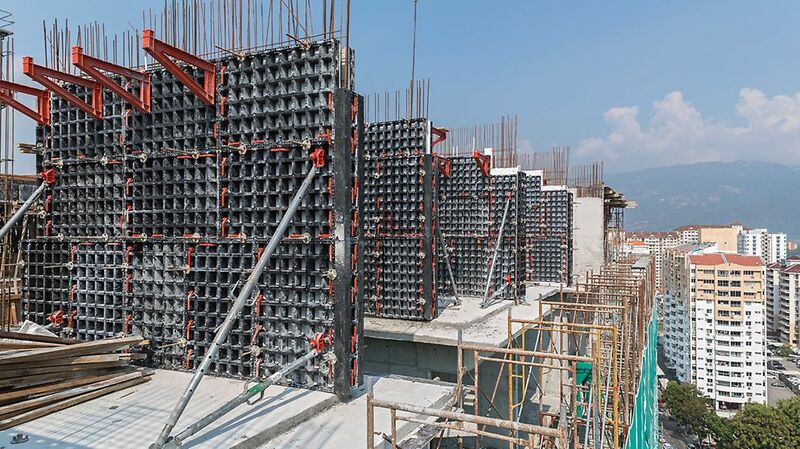 The simple formwork logic very quickly ensures fast working with the innovative system. 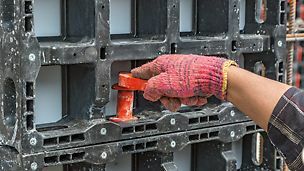 The couplers fit exactly into the openings in the panel frames and are mounted without tools. As the panels are very light they can be installed manually. The construction team works efficiently and without having to wait for the crane.